Unbeatable price-perfomance ratio and versatile applicable. Also deliverable as special purpose machines up to 14000 x 3000 mm. 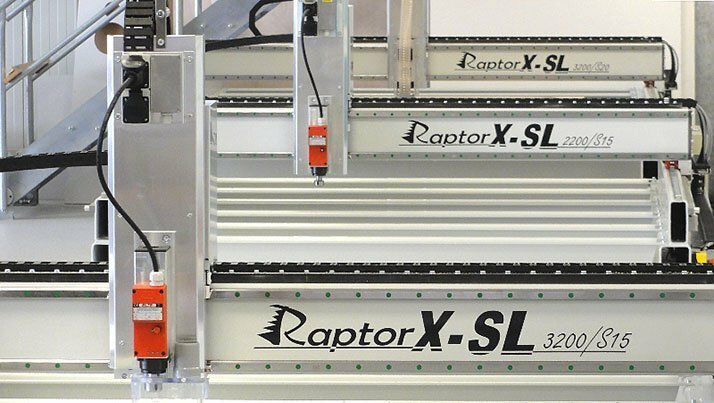 Stable, fast and versatile applicable – this is the RaptorX-SL milling machine. 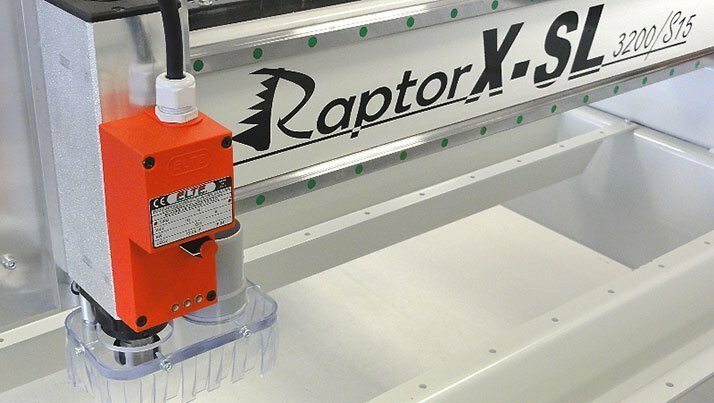 The RaptorX-SL is our stable solution for milling solid materials like steel and granite. The table is height adjustable which makes the CNC mill very flexible for machining big workpieces. The perfect machine for a more productive future. Our concept of mounting a brushless drive with a double flange and a planetary gear invisibly on the X-axis has set new standards in the CNC sector. 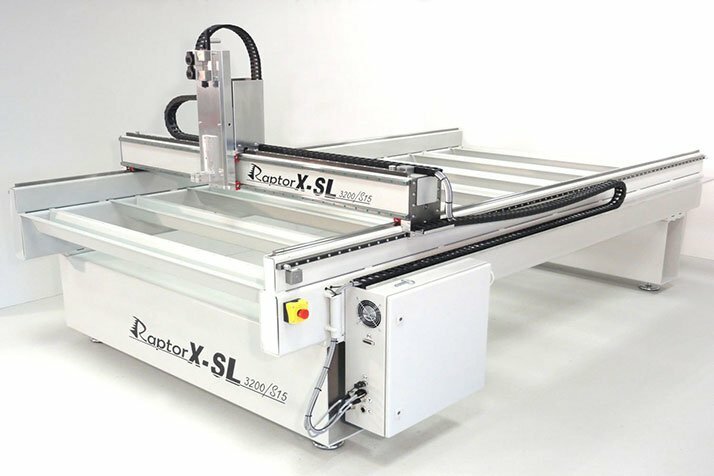 Thus the RaptorX-SL can machine workpieces with a significantly increased performance. Watch the performance during a demonstration at our production location. The RaptorX milling machine is deliverable up to a travel distance of 14.000 mm x 3.000 mm x 600 mm. 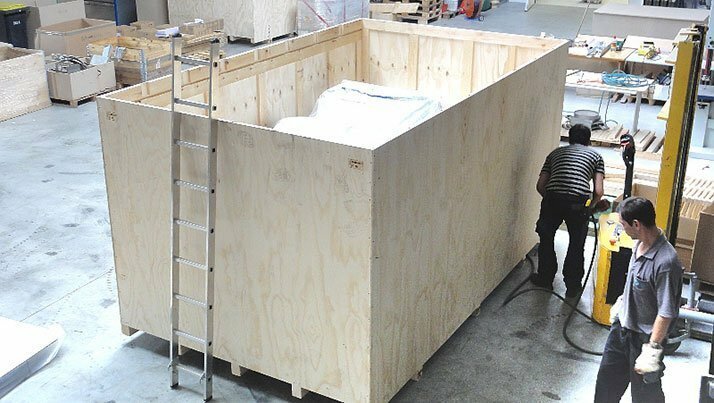 By now we have already built special sizes up to 8.500 x 2500 mm. Due to maximum stability, the CNC mill works accurately on 3D objects on each axis. After being manufactured the steel sections are glowed again to eliminate remaining tension. Distortion free and thermoformed steel sections make the machine even more precise. The RaptorX-SL mills almost every material in no time at all, regardless if you want to machine hardwood, aluminium, brass or granite. The robust milling machine meets the tough requirements in the industrial sector. Beside the top-selling CNC router High-Z and the CNC mill T-Rex the RaptorX-SL ads a large milling machine to our machinery which can process granite and steel. 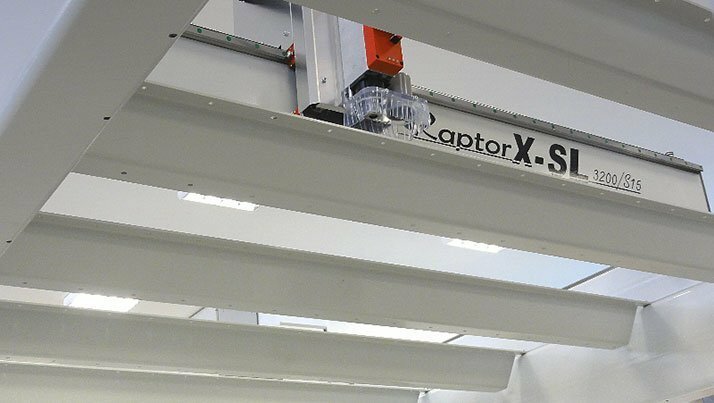 We invite you for an impressive demonstration of the big RaptorX-SL machine at our production hall (machining your desired material as well). Steel construction of extremely high torsional stability of mainly hot-formed steel profiles with a plate thickness up to 6,3mm! Highest stability: At a bridge load of 100kg in the middle of the Y axis the bridge of a 2m wide RaptorX milling machine (travel Y 2010mm) “bends” only 0,02mm, which is only two-hundredth of a mm! Therefore even spindles up to approx. 70kg or other heavy tools or tool heads can be used without loss of accuracy of the system! Variable workspace because of adjustable table support struts (optional, price per piece 195 Euro, supports up to approx. 200 kg per strut). Clearance under bridge 150mm, 300mm or 400mm selectable. 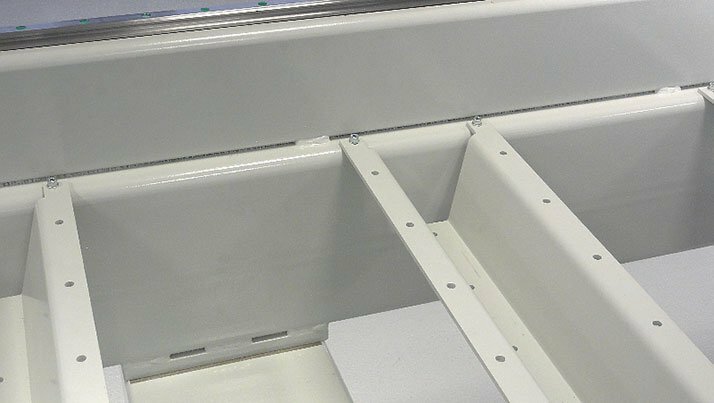 The framework is open towards the bottom which allows the machining of big workpieces (control cabinets, door- and window frames, large three-dimensional parts). High speed with maximum performance: three-dimensional drives with Mach3 software up to approx. 10 meters per minute (approx. 170mm per second), depending on contour shape. 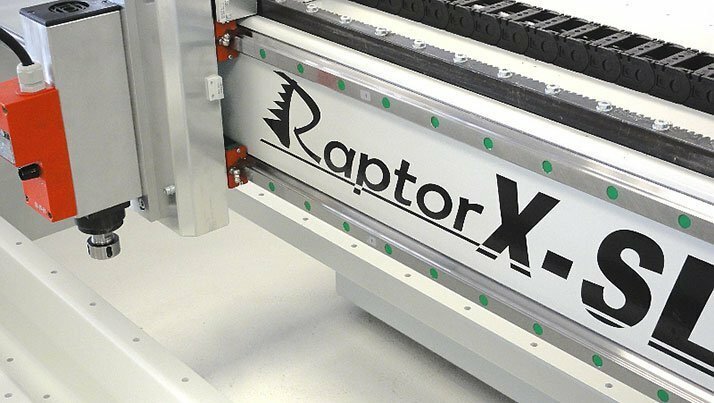 Therefore the RaptorX-SL Milling Machine almost reaches the performance of an otherwise much more expensive Servo-CNC milling machine! Finally an end to flimsy steel machines constructed of cold drawn, paper thin square tubing which is prone to distortion when welded together. Manufactured from high-quality heat-treated steel, the frame construction and 9.4 Amp Brushless drive motors that produce over 900 Ncm holding torque, provide very reliable and stable platforms that are unbeatable in their price to performance ratio. From us, you will purchase carefully thought-out technology with the necessary motor control unit as well as high-quality software included in the package price. 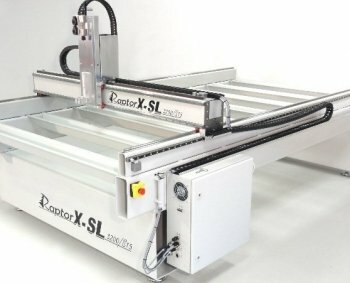 Customized machines with double Z-axis etc. can be made up to a travel size of 17.500 x 3010mm !! To achieve maximum stability and to be able to work with granite, marble or aluminium, select the correct height table to ensure the travel to the material surface is as small as possible for best accuracy. The milling machine is often mentioned in connection with the abbreviation CNC. A CNC milling machine designates a computerised machine tool, lifting off material by rotating around a workpiece, and thereby giving it a predetermined shape. Often small and large milling machines are used in the industrial sector. Due to the large variety of interchangeable tools, the CNC milling machine is to be found, increasingly, in the hobby sector. In the field of CNC mills, the most common one is probably the portal milling machine. Woodworking, e.g. 3D coat of arms, 3D wood reliefs, wooden toys, wooden signs, flaps, doors and candle arches, model components, etc. Stoneworking, e.g. Gravestones, grave plates, ornaments, nameplates etc. Increasingly popular are also applications in the field of 3D. So-called DIN/ISO G-codes are sent to the machining centre using appropriate 3D CAD / CAM software. Due to the design of a portal milling machine, it is possible to use up to 6 axes: A, B, C and X, Y and Z, the A-, B- and C-axis represents a rotation around the axes X, Y and Z. Thus it is possible to mill in three dimensions and produce 3D statues, components and much more in a single step. What should be considered when buying a CNC Milling Machine? A milling machine should always be purchased from an authorised dealer. Only a fully-trained sales personnel can propose a suitable model according to your needs. As individual as your wishes can be, the individual should be the advice you receive, because the more precisely your milling machine is tuned to key points, such as size, performance and workpiece to be machined, the better milling results you will receive later. An authorised dealer should also offer free support beyond the purchase, so entry is made easier and cheaper. An authorised dealer should also offer free support beyond the purchase, so entry is made easier and cheaper.